I wrote this feature for the Dallas Morning News. It was published on Oct. 29, 2003. José Dominguez worked until the age of 90. He swam in the ocean at 100. And even now, just after his 107th birthday, he has a sharp mind, quick wit and steady gaze. “To still be alive after all these years is my destiny,” Mr. Dominguez says. He and others living out their golden years are a source of pride for Cuban officials, who say their health care system has given the island one of the highest life expectancy rates in the Americas. But Cuba’s aging population is also a demographic time bomb, some experts warn. By 2015, as many as one in five Cubans will be 60 or older. By 2025, that number will be one in four, and by 2035, one in three – which would be unprecedented in the world, Cuban researchers say. The consequences could be dire, some say. Health costs will probably soar, the labor force will lose strength, social tensions could rise and the living standard will drop. Cuba’s population is aging quickly, they say, not just because of a high life expectancy but also because of a low fertility rate. Worldwide, the fertility rate is about three children per woman. In developed countries, it’s nearly two, but in Cuba it’s just 1.5. Researchers attribute that to birth control, abortion, divorce and the grim economy. Many Cuban couples stopped having children or had just one after the collapse of the Soviet Union sent the Cuban economy into a tailspin. And that trend has continued. Euda Luisa Tournal, a 25-year-old linguist in Havana, refuses to have children until her economic situation improves. “I’m crazy about becoming a mother, and I’d like at least two children. But I don’t want to have them now because I don’t want to have to depend on my parents,” she said. Some Cubans delay having children because of crowded housing conditions. Economist Marlen Charboniel, 29, has two children, and her husband would like another. “I’d like to please him, but we live with my mother jammed into a two-bedroom apartment. There’s no space for a crib,” she said. In the meantime, the population grows older. People 60 and over made up 9.1 percent of the population in 1970. That rose to 13.6 percent by 1998 and now tops 14 percent. Concerned, Cuban officials have quintupled funds for old age, disability and death benefits since 1970, researchers say. Spending for social security remains higher than it is for education, health or defense. Still, retirees “are probably the group enduring the most difficult conditions in Cuba today,” according to a 2002 study by Cuba expert Carmelo Mesa-Lago at the University of Miami. Pensions are meager. About 1.4 million Cubans received just $4.20 each per month in 2001. “These pensioners cannot survive unless they receive dollars from abroad or help from their families,” the Miami study said. The retirement age is 55 for women and 60 for men. Many retirees work in the informal economy to make ends meet. Almost all retirees live with their families. Thousands are on waiting lists for nursing homes, but there aren’t nearly enough beds. The Cuban government perseveres, trying to meet as many needs as possible. It has a network of family doctors specializing in preventive health care, senior citizens clinics that provide daytime care, geriatric centers and nursing homes. But that’s not enough, some experts say. Cuba’s health care system is “financially untenable,” Mr. Mesa-Lago said, proposing some solutions: Unneeded hospitals should be converted to nursing homes, he said. More money should be spent on prevention. The Ministry of Public Health should be made more efficient. And hospitals and clinics should charge user fees to Cubans who can afford them. Cuban researchers agree that some changes are needed but say the system is fundamentally sound. One thing that’s needed, they say, is a change in society’s attitudes toward older people. Cubans should stop describing them with terms such as “rusty, shriveled with age, old crock, oldster … and senile,” the Aging in Cuba study said. As it is, many older Cubans have low self-esteem, the study said. Many are bored, worried or depressed, and families should recognize they need special care. In addition, the study said, the government should make it easier for elderly people to work, even if for a half day or a few days per week. Mr. Dominguez said work has helped him live longer, though it has taken a toll on his once sturdy back. He was born in the Canary Islands in 1896. At 24, he journeyed to Cuba seeking his fortune. He worked for many years in agriculture and tended tobacco fields. He smoked, too, although he gave that up at age 51. His eyesight and hearing are good, and he spends many afternoons sitting on the porch of his home in Varadero, east of Havana. The resort town is in Matanzas province, which boasts 73 centenarians, according to Juventúd Rebelde, a state-run newspaper. Elsewhere in Cuba, there are hundreds of others. One of the most famous, Gregorio Fuentes, died in January 2002 at age 104. He was American writer Ernest Hemingway’s boat captain in Cuba and the inspiration for the book The Old Man And The Sea. Another noted Cuban, Compay Segundo, lived to age 95 and smoked cigars practically until the end, family members say. He was a legendary musician who attributed his long life to rum, romance, flowers and women. He died in July after suffering from kidney problems. Other long-lived Cubans are still ticking. 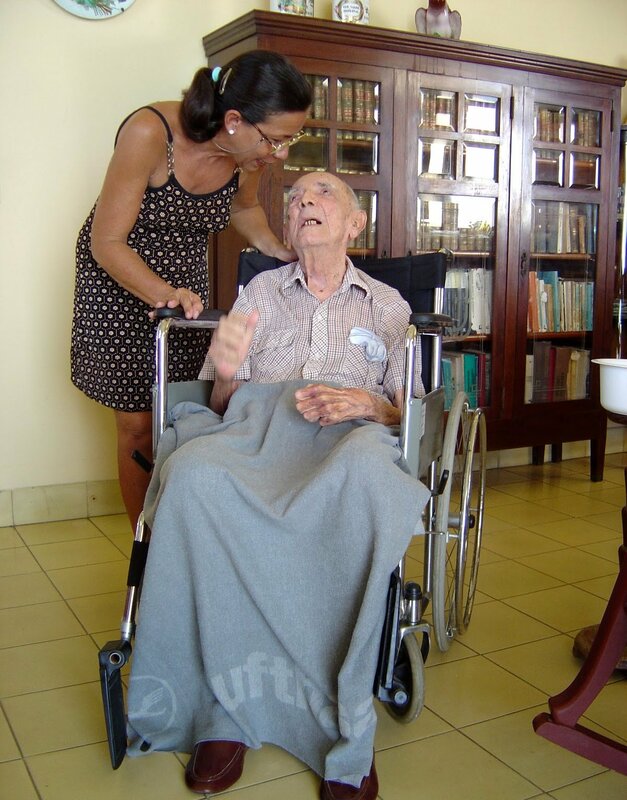 José Oscar Jimenez, a retired doctor in Varadero, is 101. And while his hearing and vision are poor, his mind is strong, says his daughter Rosa Maria Jimenez, 51. He doesn’t drink but has smoked cigars since age 13, she said. Luís Muro Bernal, 104, lives nearby. 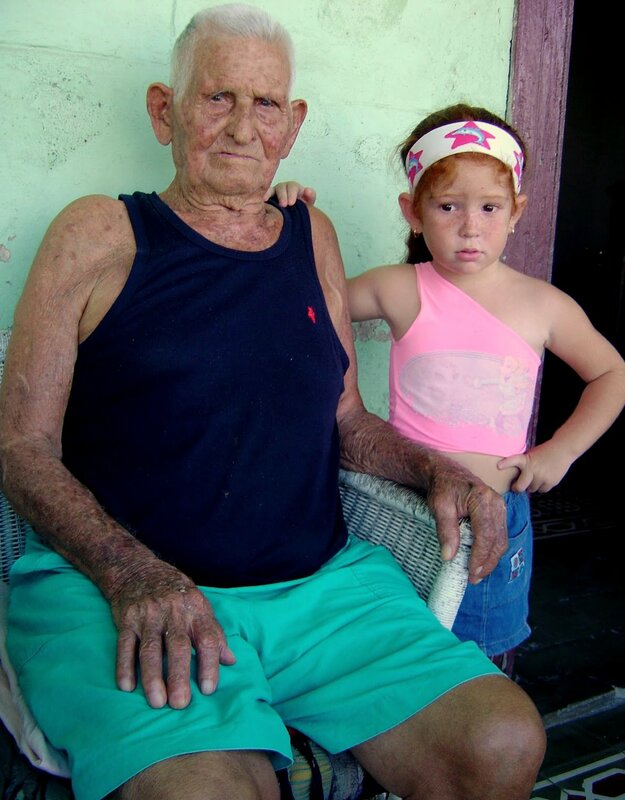 He is Cuba’s oldest retired physician, says his daughter, Angelina Muro, 71. He had a distinguished career, traveled to the United States many times and has relatives in Houston. The Guinness Book of Records says a Frenchwoman, Jeanne-Louise Calment, reached the oldest authenticated age of any human – 122 years and 164 days. She died in 1997. A Cuban woman named Evangelina Cortina is 114 years old, which would make her one of the oldest people in the world, Juventúd Rebelde says. Why some people live so long will be covered during the second International Satisfactory Longevity Conference in Havana from May 17-24. Cuban officials also plan to start a 120 Years Club for people interested in learning how to endure at least a century. For now, Cuba’s average life expectancy is 76, on par with that of the United States. Fidel Castro, the world’s longest-ruling leader, has that beat – he’s 77.